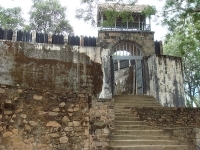 The Royal Hill of Ambohimanga is the ruined remnant of the 15th century Madagascan kingdom. Located just 12 miles (20km) from Antananarivo, the Hill features a ruined royal city, several royal tombs and numerous holy sites. This spiritual attraction is widely lauded as the premier symbol of the cultural identity of the Madagascan people. It is still a place of worship to both locals and foreigners. Set in lush green countryside overlooking a rice paddy, visitors can explore the burial grounds, historic village and palace complex. The palace itself houses artefacts which include gifts from Queen Victoria.